The Maldives is not typically known as a wind activity hot spot, but throughout the year there are pockets of time where, although still sunny and warm, the wind picks up and allows us to have some fun catamaran sailing and windsurfing. As the breeze has picked up, it is a good time to take the opportunity to introduce you to the activities in more detail. Feeling the power of the wind in the sail, which makes your cruise around on the water at full speed, is an incredible sensation. Honestly, for us it is one of the best feelings in the world, consisting of freedom, fun and action! The wind conditions in the Maldives give everyone the chance to have some fun. There are days with stronger wind for more experienced windsurfers and sailors as well as days of lighter wind, allowing beginners to get an insight into the different sports, learning them from scratch. Hurawalhi Island Resort offers a small lagoon area in front of the Ocean Watersport Center, where guests can do their first trials on the windsurf board. Windsurfing is a technical sport, requiring balancing skills, but you will be amazed at how quickly it is possible to progress to making your first windsurf rides up and down, without falling off. Varying from person to person, these first solo rides can usually be achieved after a short course of 3 hours. If the passion is awakened, there is the option to extend the tuition and even complete the full 8-hour basic course to expand skills. 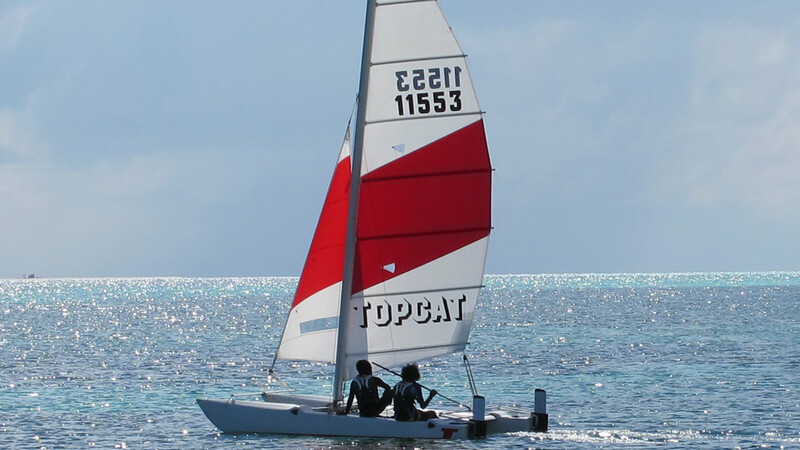 Catamaran sailing involves cruising and splashing through the waves – it’s fun and gets the adrenaline flowing; a great sport from the very first time you try it. Beginners can learn how to sail with one of our instructors who will use a step by step approach. The basic course of about 10 hours will get you to the stage where you can start to safely sail on your own. If a course is not for you but you still want to experience the thrill of the wind on your face as you dash across the water, no problem – simply be the passenger and let one of us be your skipper. You will have an adventure ride to remember! Enjoy the wind wherever you are and we hope to see you soon at Hurawalhi Island Resort!